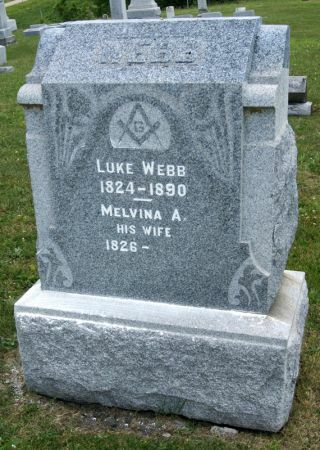 Luke Webb, son of Valentine Webb and Elizabeth Abshear, was born in 1824 in Greene Co., Ohio and died Feb. 23, 1890 in Bedford, Taylor Co., Iowa. He married 1) Martha Meek Aug. 11, 1845 in Franklin Co., Indiana and 2) Melvina Amanda Allen Feb. 22, 1849 in Maquon, Knox Co., Illinois. She was born Aug. 29, 1826 at Baltimore, Fairfield Co., Ohio, daughter of John B. Allen and Belinda Bull, and died Aug. 27, 1910 in Pleasanton, Linn Co., Kansas. Her obituary available Taylor County, Iowa gen web site. Searching for MELVINA AMANDA ALLEN WEBB in Taylor County Iowa?